Last FLL competition season’s Animal Allies challenge brought Delaware students together to create impressive solutions to real problems… also requiring them to work together to build amazing, graciously professional teams. Teams— you inspired each other as well as the judges and referees. Before we all get into the next challenge, here’s a look back on some of the fun times, great spirit and awesome costumes- including photos from the first-ever qualifier event at Delaware Boys and Girls Club in Dover and the exciting state championship at Delaware State University. Enjoy! Delaware kicked off its 2016-17 FLL competition season last Saturday, December 10 with the annual qualifier event at Conrad School of Science and Technology in Wilmington. This year’s theme, Animal Allies, was on display with team projects and in the robot-based challenges. Fourteen teams competed for the title Champion, and seven were chosen to move ahead to compete at the Delaware State FLL Championship in Dover next February 25. More about upcoming qualifiers and the state Championship can be found here. Rachel Hannaford, MOE FRC alumni and past team webmaster, cheery as ever, volunteered at the Conrad School of Sciences FLL competition in Wilmington last Saturday where her dad Peter Hannaford, along with Beth Blohm, coordinate and host the popular annual event. 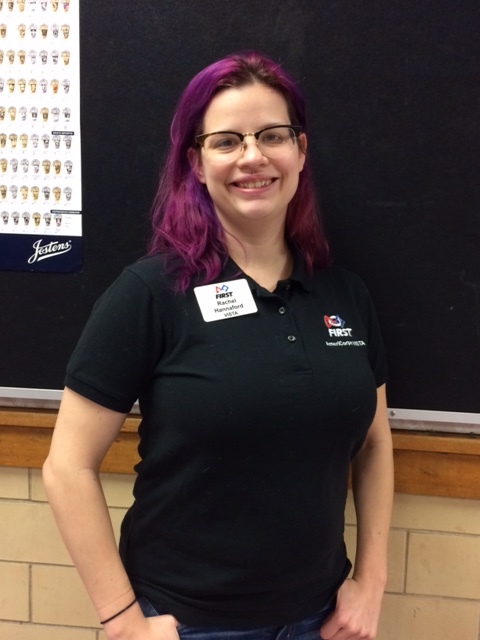 While Rachel served as referee and behind the scenes organizer—both jobs were easy fits since she is currently working as an AmeriCorp VISTA member with the regional FIRST (For Inspiration and Recognition of Science and Technology) robotics program in Gainesville, Florida. Thinking about starting a FLLJr. team? FIRST Tech Challenge- Relic Recovery! Sign up and support us!